The New York Times reports that bank lending is still frozen because the debt securitization market, which collapsed last year, is still dead. But here’s my question: why does it have to be a return to shadow banking? The banks don’t need to sell securitized debt to make loans — they could start lending out of all those excess reserves they currently hold. Or to put it differently, by the numbers there’s no obvious reason we shouldn’t be seeking a return to traditional banking, with banks making and holding loans, as the way to restart credit markets. Yet the assumption at the Fed seems to be that this isn’t an option — that the only way to go is back to the securitized debt market of the years just before the crisis. Why? Are we still convinced that securitization is a far superior system to conventional banking, and if so why? Good question. Does it have to do with still weak bank capitalization? 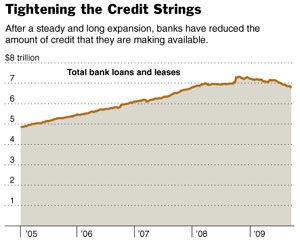 After all, if banks are still deleveraging, there’s no way for them to expand their loan books unless they can sell off the new loans they make. So it’s either securitization or nothing. Alternatively, it could be that banks simply aren’t willing to take on the risk of new loans and are only willing to extend credit if they can sell off the risk to someone else. But that doesn’t seem like much of an explanation. Back in the boom years, there were plenty of eager buyers for loan bundles who didn’t care much about the quality of the underlying loans, but those days are long gone. If the loans aren’t top notch, nobody will take them. So there’s not much point in trying to move the risk around just for its own sake. In any case, I wonder if this is really a worthwhile concern? Securitization has been around for decades and isn’t necessarily a bad thing. It only becomes bad when the securities themselves, which are relatively simple, get bundled into ever more complex bundles of CDOs, CLOs, synthetic CDOs, etc. etc., all with implicit leverage of 30:1. It’s the second and third level bundling and the outrageous leverage that helped fuel the recent credit bubble, not plain jane securitization. Anybody have some alternative explanations?